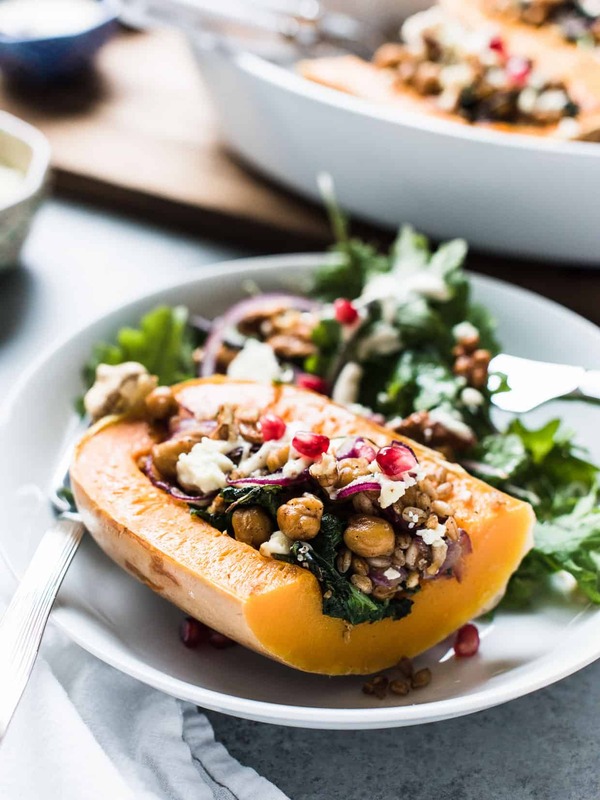 This Stuffed Butternut Squash recipe is colorful enough to be a beautiful vegetarian side at a Thanksgiving table, but also simple enough to make for a wholesome weeknight meal. 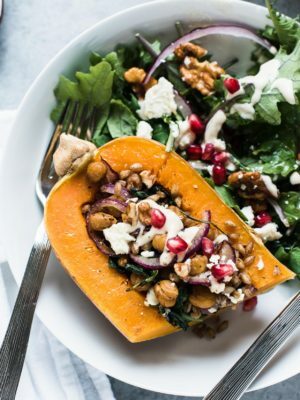 This Stuffed Butternut Squash recipe brings a vegan power bowl to the Thanksgiving table, or turkey day worthy flavors to an easy autumn meal! The last time I peeled a butternut squash, I cut myself. I admit that I was in a rush, and worse, complacent, which tends to happen when I’m using a vegetable peeler. The next time I picked up a squash at the market, it forced me to think twice. Better roast it, I told myself. Besides, it’s infinitely easier, and my favorite way to wrangle any autumn squash. I just love the way roasting squash brings out its inner sweetness and how it can serve as its own vessel. As for the filling, ever since I reviewed and shared my experience with Terra’s Kitchen, I’ve been enamored with the Vegan Power Bowls I tried. I’ve recreated it several times in my kitchen, but with ways to shave time and use less pans and cookware — anything to streamline the process. 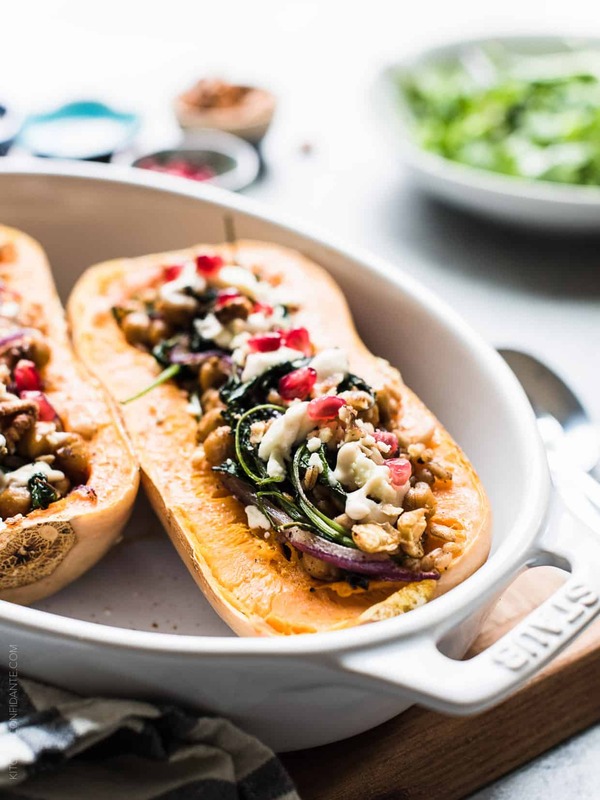 I figured I could make Stuffed Butternut Squash Power Bowls, saving time and adding flavor by making the squash their own bowls! 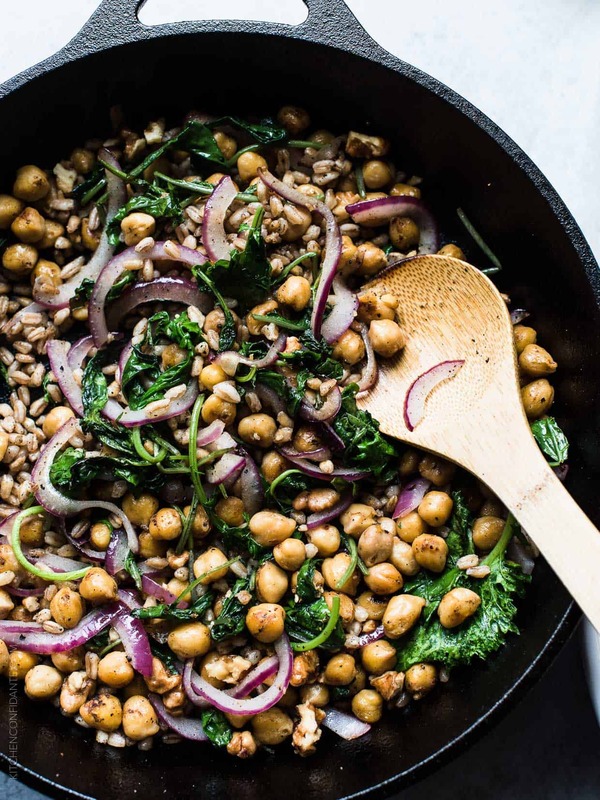 The filling is all about warm, autumn flavors, and is full of spicy chickpeas, toasted farro, healthy kale and red onions and dressed with a super simple tahini sauce dressing. For extra flavor I topped it with feta cheese, candied walnuts and pomegranate seeds. It’s colorful enough to be a beautiful vegetarian side at a Thanksgiving table, but also simple enough to make for a wholesome weeknight meal. Preheat the oven to 400°F with the rack set in the lower third of the oven. Slice the butternut squash in half and remove the seeds. Scrape a little well along the length of the top of the squash halves just to give the stuffing a little place to settle. 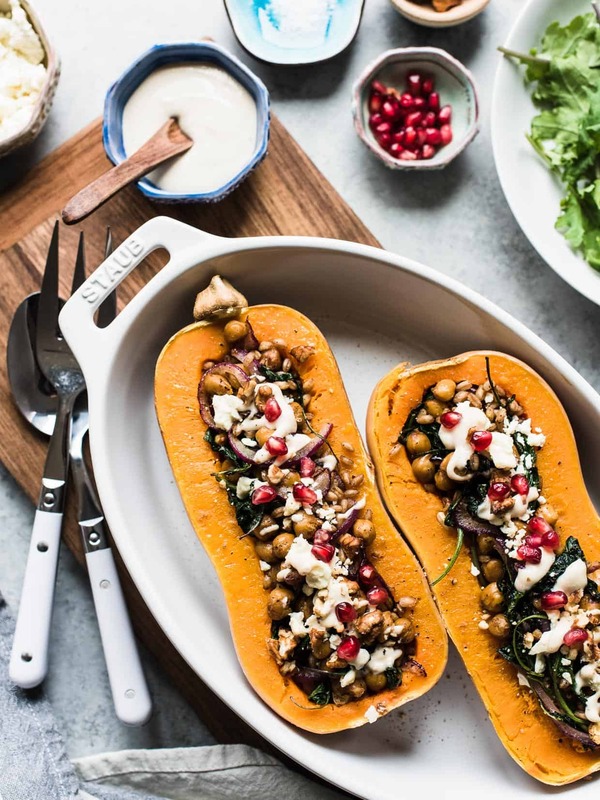 Place the squash in an oven proof dish. Take about 1 tablespoon of the olive oil and brush the squash flesh. Season with cumin and salt and pepper, to taste. Place in the oven to roast until the squash is tender and yields to a sharp knife, about 40 minutes. Meanwhile, in a small bowl, toss the chickpeas in the chili powder, brown sugar, and a little salt and pepper. 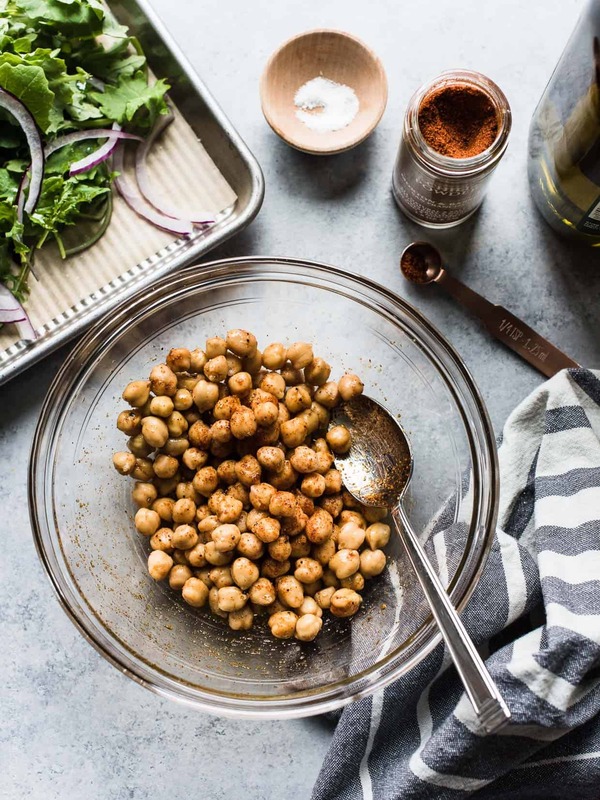 Heat a skillet over medium high heat, add the remaining tablespoon olive oil, and cook the chickpeas, stirring occasionally, until brown, about 5 minutes. Stir in the farro, and let it toast for a minute. 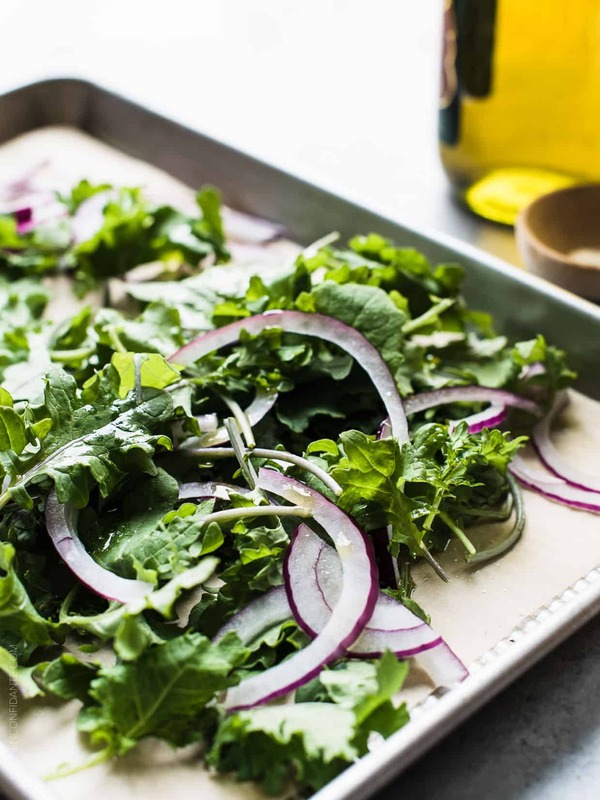 Lower the heat and add the onions and kale, and cook until the onions just begin to soften and wilt. Remove from the heat. When the squash is tender, remove from the oven. Toss the feta cheese in the farro and chickpea stuffing, then spoon into the squash. If you need to reheat the stuffing, return it to the oven for about 5-7 minutes. Right before serving, sprinkle with a little more cheese, candied walnuts, pomegranate seeds and drizzle with tahini dressing. Serve with additional dressing and cheese on the side. Yes, the last time I tried to cut up a butternut squash, I nearly lost the tip of my finger in the process! Your method is infinitely better, and much safer :). This looks so cozy for a rainy fall evening! Yikes, Laura! I’ve done the same with onions (long story, I’ll save it for another time!) – NO fun! Yes this is much safer, and thankfully, very tasty, too!